But Wednesday’s Gospel reminded me that sometimes we need to be in the boat before we start jumping out in the wild wind and waves. Mark 6:45-52 tells the story of how Jesus comes walking on the sea towards the disciples as they are being tossed about in the boat. The disciples are frightened, think they see a ghost, and Jesus tells them, “Take courage, it is I! 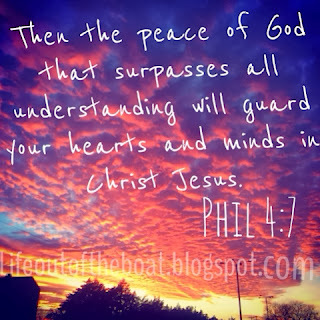 Do not be afraid!“ Jesus gets into the boat with them, and suddenly everything is at peace. No wind, just calm seas now that he is in the boat. During the homily, Father reminded us that sometimes we need to invite Christ into our boats. We need to realize that the peace we are looking for in the midst of chaos and confusion is often found when we ask Christ to be part of our lives in a more concrete way. As I thought about this throughout the day I realized that this is where I am in my own “boat adventure” with the Lord. January is the beginning of my busiest season at work. It’s also the time of year where I’m looking ahead and realizing all of the many things that need to get done. This year is a little different because I’m also preparing for some big changes in the months to come. I found out last week that my pastor is being moved to another parish, and that we’ll have a new pastor at the beginning of February. I’ve gone through pastor changes before, but this is the first time that it impacts me as both a parishioner and a parish employee. New pastor means a new boss, and likely some change in the life of the parish. I’m certain that good things are ahead, but it is still challenging. My current pastor is the one who hired me, and the one who has taught and formed me over these past few years. He’s been an incredible mentor to me, and is the one who has shown me that ministry more than anything else is about serving the needs of the Body of Christ. His announcement about the upcoming move brought on a fair share of tears. Change is hard, but it is also an indication that God is at work. In the midst of this time of transition there’s a temptation to want to conquer all of these things head on without taking the time to pray about them. “I CAN HANDLE THIS! Let me out of the boat! I’m ready!! BRING ON THE CHANGE!” But the truth is if we don’t take the time to pause and pray before diving out of the boat we can set ourselves up to sink. I feel like God is putting on my heart to be still and invite him into the boat. This is going to be a busy year. It is going to be a challenging year. But I think that 2014 will be yet another opportunity to grow as the woman God created me to be. Not only will I experience change and challenges at work, but I’m also learning and growing in my vocation as a wife and discerning when I’m called to be a mother. In all of these things, whether at home or work, I need to make sure I’m resting in the peace of Christ before hopping over the side of the boat to conquer waves on my own. Peter started to sink because he looked away from Christ and the waves and wind overcame him. If we don’t take the time to look at Christ, particularly in moments of change and transition, we might not realize that God is preparing us for what is ahead by surrounding us with His peace. Walking on water is an incredible adventure, but it also requires asking our Lord to be part of the journey.